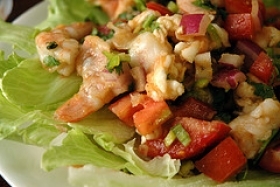 Have you made Ceviche 2? 1. 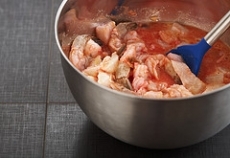 In a ceramic bowl, place the fish which has been cut into 1/2 inch squares. 2. Dice the onion and finely chop the garlic. Clean the peppers and cut into very small pieces. 3. Cover with fresh lemon juice. Season with salt and pepper. 4. Make sure the lemon juice covers the fish and the vegetables. 5. Refrigerate for at least 8 hours. Serve with crackers as an appetizer before cocktails or as first course on lettuce leaves. 6. To make it easier to slice the fish, freeze it slightly. 7. A glass bowl may be used, but not metal or plastic. This recipe contains potential food allergens and will effect people with Lemon, Fish, Sulfites, Garlic, Fructose Malabsorption, Iodine, Onion allergies.